California has had several large wildfires this month. Most notably, the King Fire, which has so far burned 97,099 acres in El Dorado County near Pollock Pines, east of Sacramento. The fire injured six people and burned 12 structures. Controlling the fire was greatly aided by some weekend rain and, as of September 30th, the fire is 92% contained. The Sierra Nevada Conservancy released a report this month calling for more forest restoration, in order to protect forests from disease and wildfires. The report estimates that between 6 and 9 million acres of land managed by the US Forest Service are in need of restoration. The Conservancy is developing an Action Plan to address the issues identified in the report. As of September 15th, CAL FIRE has responded to 4,750 wildfires on 86,783 acres since January 1st. The year-to-date historical average is 3,777 wildfires on 84,356 acres. These figures only represent CALFIRE incidents and so the total number of fires and acres burned is much higher. Despite the number of fires increasing, The San Francisco Chronicle reports that state and federal officials say that California has actually seen fewer acres burn this year than last year. -A recent poll from the Public Policy Institute of California found that 72 percent of likely voters say water supply is a “big problem” in their part of California, up from 61% two months ago. In addition, 58% of likely voters support the proposed water bond (Proposition 1) and 67% would vote yes if their district had a bond measure on the ballot to pay for water supply projects. -On September 25th, Governor Brown signed SB 985, a bill designed to encourage the capture and use of stormwater. Earlier this month, Brown also signed SB 1420, which improve water use reporting to the state; in particular, the law requires urban water suppliers to quantify and report on distribution system water loss. AB 2104 prevents homeowners associations from penalizing homeowners that replace their lawns with drought-resistant plants. -The Bureau of Reclamation has released a new report assessing the impacts of climate change on the Sacramento and San Joaquin Basins. The report finds that projected changes in temperature and precipitation, combined with a growing population, will have significant impacts on water supplies, water quality, fish and wildlife habitats, ecosystems, hydropower, recreation, and flood control. -The Bureau has also again increased water releases to the Trinity River to combat a salmon parasite that attacks salmon in stagnant water. 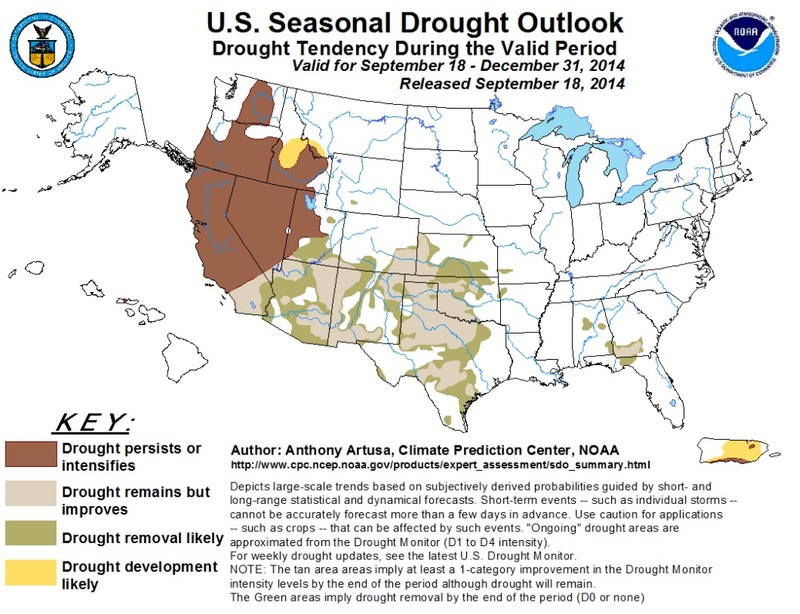 Drought conditions are effectively unchanged from two weeks ago. 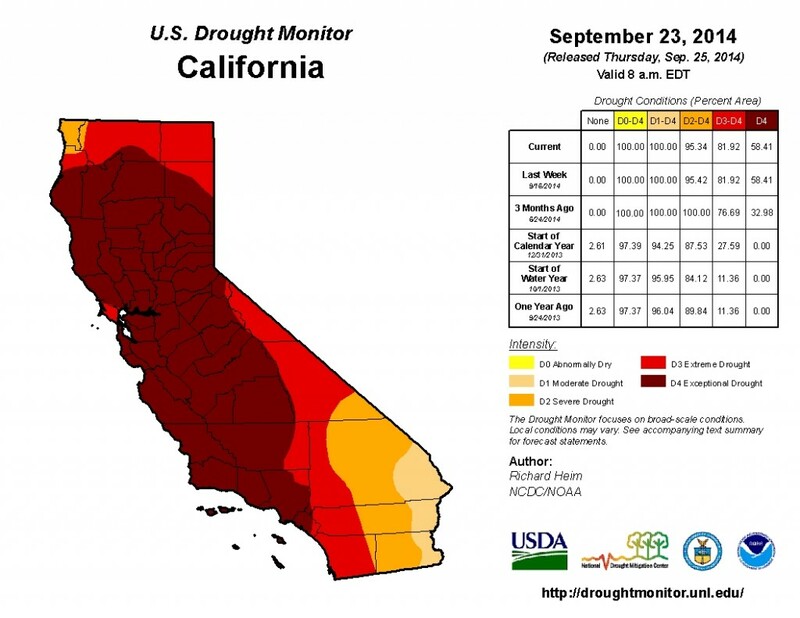 The new seasonal drought outlook from the National Weather Service’s Climate Prediction Center predicts the drought will improve somewhat in the southernmost portion of California, but will remain unchanged in the rest of the state. 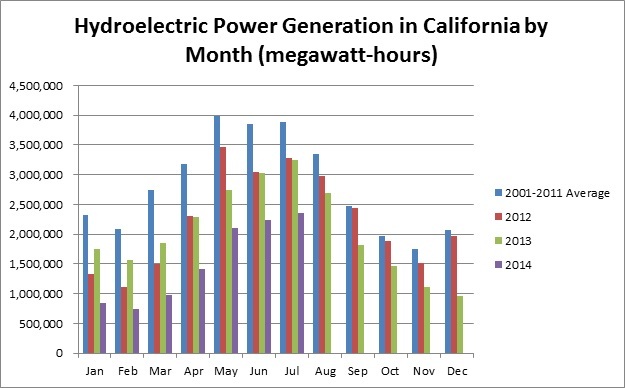 The U.S. Energy Information Administration released the Electric Power Monthly report for July. 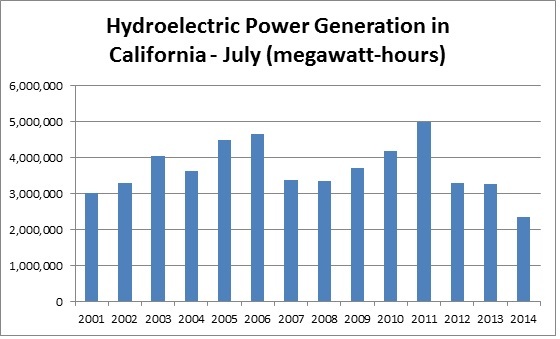 July generation was 73% of last year 61% of the 2001-2011 average. 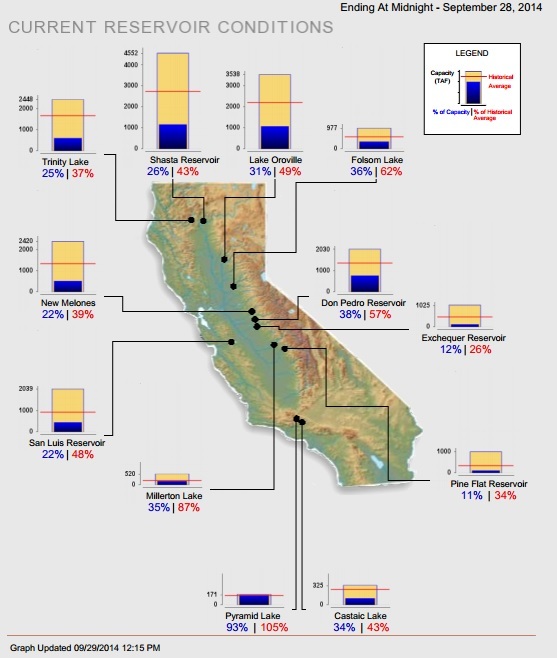 Statewide, California’s major reservoirs (representing more than 27.2 million acre-feet of storage), are at about 30% of total capacity and 52% of normal.